The highs and lows of life hit me harder than most this week. From the sheer joy and exhilaration of a hike in the Cascades to taxes to marking the first year of Claire’s passing. Then there’s my zen zone. The kitchen, which is truly a meditation. This is how this chana dal recipe came about. But it’s zin as long as things are going my way and Rob’s not hovering over me. It’s not always so zen ;) . We hiked this weekend was at Baker Lake in the Cascade Mountain Range. We slept in on Saturday and on a whim decided to go. We opted for an excursion instead of pulling weeds, as neither of us could muster the motivation. The day couldn’t have been more beautiful with clear, blue skies, a light breeze, and cool temperatures. We stopped on the way to pick up a picnic lunch and headed towards the mountains. The trail provided an easy walk with gradual inclines, passing through second-growth, some old-growth forest and burnt out cedar tree snags from the 1843 eruption of Mt. Baker. We stopped often to gaze, listen, and breathe in the fragrance of a beloved forest. Along the trail we came across a raging river fed by glacial melt that had washed out part of the trail leading to a felled tree footbridge. I knew I had to cross it. I was hesitant. Fear of falling and smashing my head on rocks while being saturated in ice cold water was not my idea of how to spend the weekend. Rob encouraged me. I resisted. Finally, after some encouragement, self-talk and seeing a 60-something woman scramble herself and dog over the rocks and raging water, I, feeling like a wuss, went for it. I made it with one wet foot and a big smile. Then I realized I had to eventually go back and cross again. Note to self: seek out loop trails. It was a good day. And I didn’t think about taxes. Coming home to make this simple chana dal recipe was pure pleasure. Chana dal is a variety of split chickpea that’s high in fiber, protein, and iron and is found in many Middle Eastern and Indian foods. It has a sweet earthy flavor and can be used in dal, curry, spreads, dips, soup, and casseroles. Chana dal can be hard to find, so if unavailable, I sub chick peas in this recipe. Although this recipe is not authentic to Indian cuisine (I asked my friend Rakhee), it has a fabulous assortment of spices, textures, and flavors. 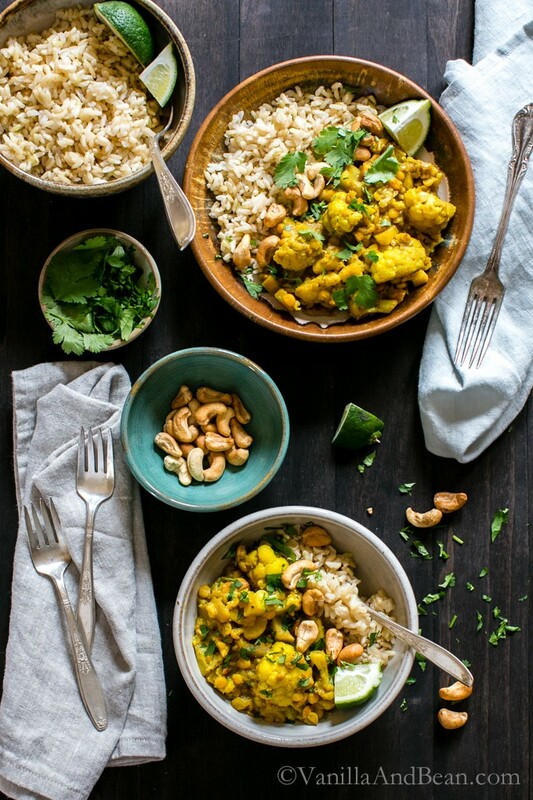 Rich in turmeric, cumin, cardamom, mustard seed, garlic, and ginger, the spices and onions saturate the cauliflower, chana dal, and coconut milk, turning this into a flavor-rich and nourishing meal. First, cook the dal and toast the cashews. Meanwhile, saute the onion, mustard seeds, ginger, garlic and spices. Add the carrots and cauliflower and a bit of water. Next, stir in the dal and coconut milk – take a deep inhale of deliciousness. Simmer for about 50 minutes and spoon into rice filled bowls. Last, top with chopped cashews, and cilantro and serve with lime wedges, rice and cilantro. 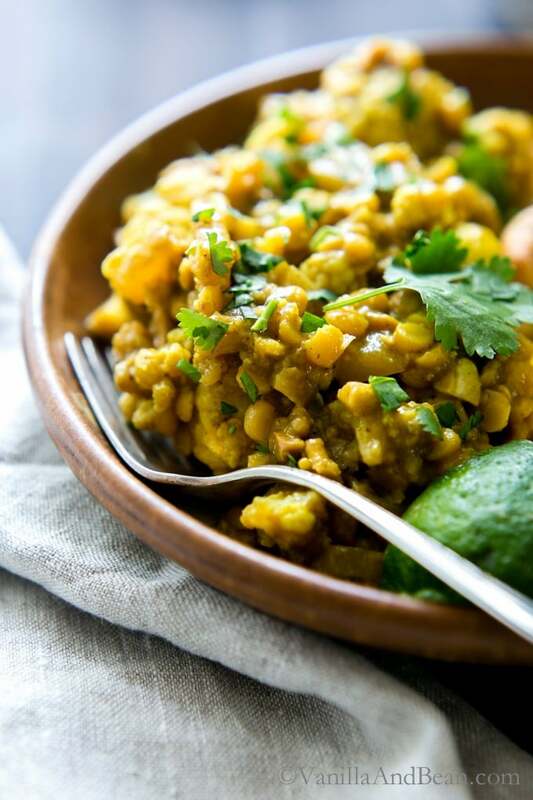 This chana dal makes excellent leftovers too… or for the ease of a freezer meal, simply store in lidded containers, in the refrigerator for up to two weeks. In a small sauce pot, add 2 1/4 C (500g) water, chana dal and bayleaf. Bring to a boil, turn down to medium low and simmer for 25 minutes. Drain, discard bayleaf and set aside. (this can be made up to two days in advance). Toast cashews in a 350F (180C) oven for 15 minutes. Rough chop a hand-full for garnish. Set aside. Meanwhile, while the dal and cashews are cooking, in a 5 quart Dutch oven, heat the coconut oil until shimmering. Add the onion, ginger, pepper, mustard seeds and sea salt. Cook on medium-low stirring occasionally for 5 minutes or until onions are soft. Add the cumin, turmeric, cardamom, grated garlic and 1 Tbs water. Cook on low, stirring occasionally for 5 minutes. Add the carrots, cauliflower and 1-2 Tbs of water. Stir, cover and cook on low for 15 minutes, until the cauliflower and carrots are tender. Add the chana dal and coconut milk, stir and cook on low to warm through, about 5 minutes. Stir in the whole cashews. Stir in the Tamari to taste. Serve with rice, chopped cashews, cilantro and lime. A squeeze of Sriracha is nice for those who love the spicy. Store in the refrigerator for up to three days or freeze for up to one month. *Chickpeas can be subbed for Chana Dal in this recipe. **Peppers can vary in their heat. Before adding the serrano to the pot, test it for heat and adjust to your taste. Recipe inspired by Heart of the Plate. Thank you. This was yummy!!!!! I’ve made this recipe a couple of times now, and we really like it. As someone who has learned to cook South Indian food, I make a few changes to the recipe, mostly in the order of cooking the spices. My changes are to sub out Curry leaves for the Bay leaf, and use whole cardamom (green) instead of ground. I also change the order of things in the Dutch oven: once the oil is hot, I add the mustard seeds, and wait for them to pop, then add any other whole spices, like the cardamom. Only after that is fragrant, I add the onions, then the Serrano peppers, followed by ginger and garlic. Then the ground spices are added, and when they are all smelling good, the carrots go in to cook for a while, before the remainder of the ingredients are added. I made this recipe tonight for dinner with a few modifications (nothing drastic) and it was outstanding. I only used 1/2 t. salt, omitted the tamari, used a small can of mild green chilies,2 T. ketchup, and thickened the sauce with a bit of cornstarch. I also used your chickpea sub, which was awesome! My family says this is a keeper and I agree. So easy and tasty. I’m thinking of trying this in my slow cooker next time and maybe adding extra firm tofu. Bet it would be great with potatoes too! This was amazing, thanks for a great recipe – at what point should I have added the cardamom? I searched to be sure I didn’t miss it, but I don’t think it’s mentioned after the ingredient list. Also, I’m assuming it’s green cardamom? I also have black and white, but those are rare in recipes. (I only have whole pods and have to grind my own.). I guessed green and added it with the turmeric. This recipe was phenomenal! We felt like we were at our favorite restaurant. Thank you so much for sharing it! Cooking is definitely meditative to me. It’s where I get to create and it make some happy. So glad you guys opt for a hike instead of pulling the weeds, I would too. I’m sure Claire would have approved! Hiking helps me feel connected, ya know? As for the dish, it’s pinned for trying, looks fab. Don’t get me started on taxes… paid all year and we still owe! Ugh! I love hearing this, Kevin! No doubt, being creative feeds the soul… soul food, right? And yes, Claire would approve, lol. Feeling connected, yes. I get it. Trees, being in nature is completely grounding. I love it too. Thank you for pinning, Kevin! I so hope your taxes are done now! You list Tamari in ingredients but not in cooking instructions. Hi Peggy! Thank you for your note. Stir in the Tamari after the cashews to taste (end of step 3). This made me teary eyed! Losing an animal is like losing a child, in a way. Next month will make it three years since I lost my first pup and it kills me to think about. That was the worst day of my life, but at the end of the day I am grateful for all of the love she brought me while she was here. I wouldn’t trade it for the world! I can see how preparing this dal is therapeutic for you. The smells, the sounds, the tastes. It is easy to get lost in such a flavorful and comforting meal. I’m excited to try your version with the cashews and coconut milk. It looks like perfection! Beautiful photos and this recipe looks wonderful. I find kitchen time meditative as well, as much as I don’t like cleaning..the simple act of preparing meals is totally mediative. I love cooking Indian food also, it’s such a great cuisine for plant-based dishes! I hear you about tax season, it used to be so great when I got money back but these days it puts a dark cloud over everything! I’m also a big scaredy cat when it comes to things like jumping over rivers lol, but my husband usually talks me into it! I’m glad you at least had one dry foot :) These pictures are gorgeous and this dish looks amazing! It looks like exactly what I would want to eat after a long hike! Sorry to hear about Claire Traci, the anniversary must bring back all the pain and grief all over again. I find hikes are so good for clearing your head though – something about nature and fresh air (SO cliche, but it’s true!) with no traffic noise, no screens for distraction – just you and your legs. I have been using cauliflower much more lately – the aim for tomorrow night is to try a whole roast cauliflower recipe. 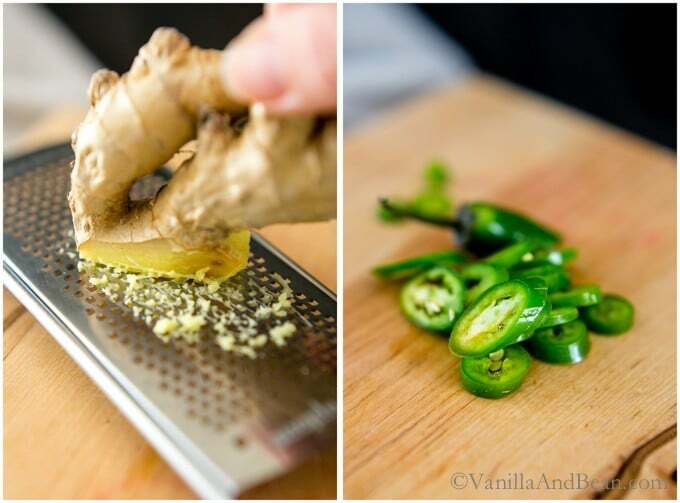 This looks like another amazing warming way to use it – I love all the spices and coconut milk you have infused it with. Gorgeous! Thank you for your kind words, Claudia. No doubt being in nature helps me clear my head and put things into perspective. I’m so glad you’re venturing into the world of Indian cooking! With your talent for combining flavors, I have no doubt that this is seriously delicious. I actually have never had chana dal, which is bizarre because I adore Indian food and lentils! I’m going to have to try this soon – it looks perfect for a comforting, healthy meal. I’ve never raised any pets, but I can only imagine how difficult it is handle their loss.I just read your tribute to Claire, and it’s so moving. And, gosh, that dream. Bittersweet indeed. Sending you virtual hugs! I just read Claire’s tribute and was so touched by your relationship with her. I hope that you can still accept my love and prayers for you, Claire and everyone else in the family. 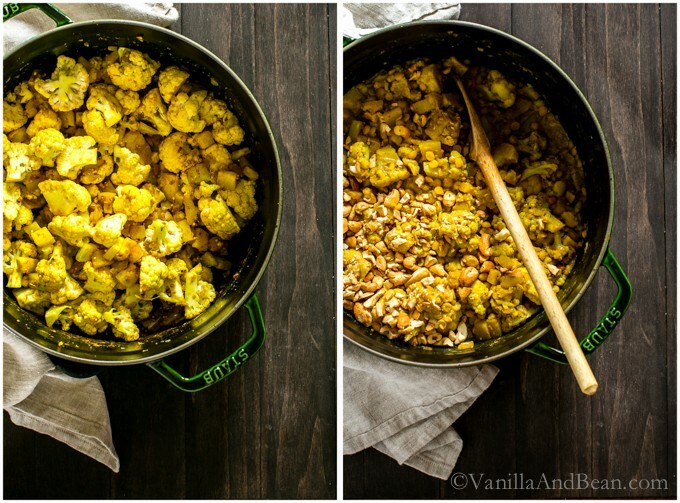 Anyways, your photography is absolutely stunning and I adore this chana dal cauliflower recipe–Indian food is my favorite! So sorry about, Claire. I lost my cat about a year ago as well. On a more positive note, I love this recipe! I think Indian food can make some of the most satisfying vegan meals. I’m so sorry to read about the pain your heart continues to experience from Claire’s passing. I started to read this post while I was on the treadmill but had to close it as it was getting me all choked up and I couldn’t breath. Tomorrow marks the one month passing of my little Asia. It’s been really tough as my hubby has been in Shanghai and I have been going through this alone. I can hardly believe she is gone. But it’s these good memories that we will always have within our heart. . .the little thoughts that give us comfort knowing we provided them with the best life possible. I’m really happy that you are still feeling Claire’s presence. I haven’t felt that yet with Asia but still hopeful that time will come. And this dish. . .it looks like a giant pot of comfort. . .just what the soul needs during these tough times. I know how hard the loss of a pet is, Traci, as the year anniversary of my oldest pup’s death is approaching, so my heart weighs heavy for you. But the image of her patting your face with her paw made me smile, and I hope those memories of her bring you much joy, my dear friend. I’m sending lots of love and hugs your way!! I hope you have a beautiful weekend, friend! Sounds like a lovely weekend you’ve had Traci! Cooking is definitely meditative to me, too :) I’m so sorry about Claire, I know how loved she was! 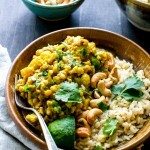 This cauliflower dal looks amazing! Thank you so much Mira, for your kind words xo. I know how important pets can be Traci and it’s tough when one physically goes out of our lives. The loving thoughts of them keep us going. And I agree, cooking in my kitchen is extremely meditative for me too. The kitchen has always been my happy place. I love this dish today Traci. So full of flavor. I have a very good friend who is my India (my samosa helper! ), so she is always getting me to try new things. I just made a wonderful vegetable curry with cauliflower that was wonderful, so I know I’m going to love this dish too. 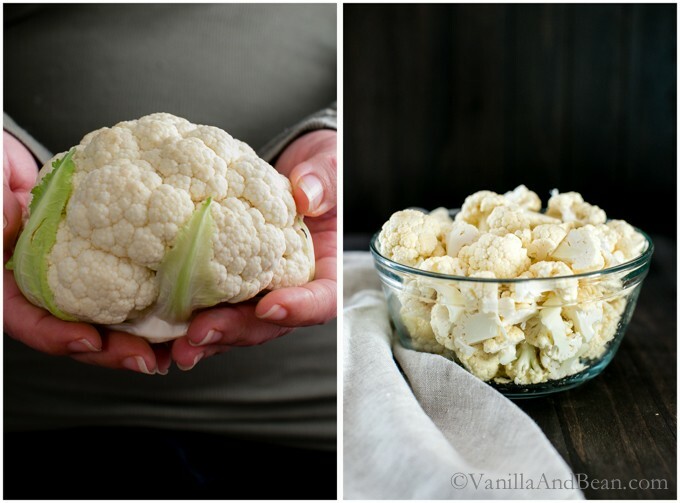 I’m always looking for new recipes with cauliflower. Putting this one on my list! Enjoy your weekend! Loss of a loved is so so hard dear Traci and I can imagine how difficult it is to cope even though some time may have passed. There was a quote I read long ago about how the pain may become less everyday but it never goes away completely which is so true but find comfort in the fact that every day will make it just a teeny bit better. 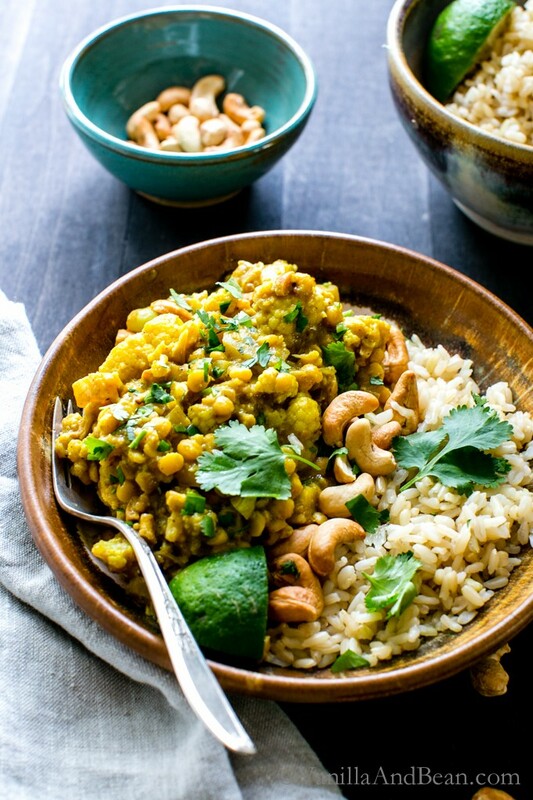 This chana dal looks like perfection! And I am a teeny but jealous that I didn’t come up with those flavors myself! Sorry if I didn’t help you more, I was asleep (somewhat) when I was responding to you! And no you didn’t disturb me, its just that I am literally the most restless sleeper you will meet. But I digress. This is such a beautiful looking dish and I am certainly going to try it! Pinned! Thank you for your sweet words, Rakhee. They are so heartfelt. I can’t wait to make this for dinner one night next week. The sun is setting earlier every evening and my runs are getting colder so this will be the perfect comfort food one night. Thank you for your sweet words, Amy. Indeed she is there. xo I hope you love this, Amy! Sounds like it’s time for cozy! Yum, yum, Traci! I will distract you for a moment from your bittersweet Claire thoughts. This recipe reminded me of a 6 day river trip I took on the lower San Juan River in Utah. We each took a night to cook and have a signature cocktail. I pre-prepped roasted veggie lasagne that was cooked in a Dutch Oven with a Ginger Basil Limeaide Pom martini. (Yes, we had ice!) My friend LaLa, on the other hand, brought multiple pouches of Tasty Bites. The last night we camped on a damp and mosquito infested sandbar in the middle of the river not too far before it meets Lake Powell. She whipped out those repulsive pouches…and I rebelled. Please remember I’m allergic to the sun and had been covered in hives for the last 3 days. And, I was not allowed cocktails for a few reasons. I wanted to kill them all. So, I made them dig through the coolers for all of the leftover ingredients and set up a bottled gas stove. I ate my quesadilla, found a spot for my Paco Pad that wasn’t quicksand, soaked myself in nasty bug goop, and prayed for a quick night. But, I did not eat those Tasty Bites! Your recipe looks delightful! My brain is yours to pick as always! I use kitchen time as a type of meditation, too (and then skip actually meditating..) and it is wonderfully calming. I hope you’re doing okay – it is so hard to lose a pet. I still have dreams about Chucky, who we got when I was a baby and died a few years ago. (For a while, I was having hallucinations that he was following me around, too. He died right when my depression was at its worst.) Your hike sounds like it was the perfect choice. A little time with wilderness and some kitchen time cures all ills, right? This is perfect comfort food, too. Your photos and styling are beautiful as always, especially because curry is notoriously hard to photograph! Sending love your way this week. This looks like one delicious recipe! 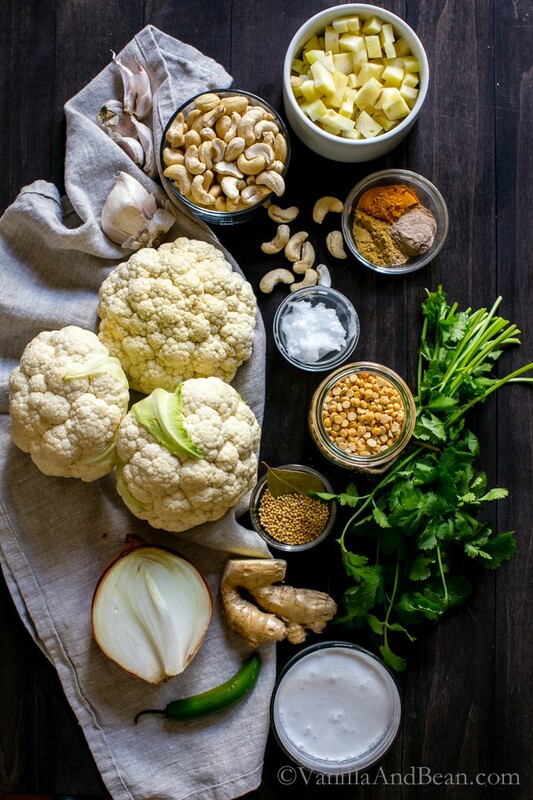 Cauliflower and coconut milk is an awesome match, isn’t it? So sorry to hear about the passing of your fur baby. I’ve went through that in the past and it’s soooooo sad and heartbreaking. Your dream must have given you peace, though. I find the kitchen super relaxing, too. It’s nice because when I’m there I’m just focused on the task at hand. Pinning this wonderful recipe. Isn’t that funny? I am sending lots of positive energy and love to your way for your healing. And this dish… I, too, love Asha’s blog and recipes and find it to be a source of inspiration. And boy, does this dish look amazing… Magic of cauliflower. Lovely photos and presentation, as always. This is making my mouth water, love the flavors and how it comes together. Cauliflower is my catch-all!! I’m happy that you and Rob opted for the hike vs. pulling weeds…so much of this post speaks to my heart, Traci. Such a gorgeous dish to share on this bright and sunny Thursday… Thank you, my friend. What a wonderful, nourishing bowl! My taxes are (finally!) done, so I’m feeling a bit more at ease. And interestingly, I had a terrible dream about my Dingo the other night – she was trapped in a burning house and I couldn’t get to her. I woke up and tears and couldn’t shake that awful feeling for a couple days. Probably brought on by stresses of life. As they are. Your hike sounds fabulous. Glad you crossed that water! Sending you hugs! XOXO! This post has my heart! Hiking on beautiful Whidbey, a visit from Claire, and your bowl from my hands! I’m sending love, my brave and creative friend! Thank you for your sweet words, Deb. xo I keep going back to your Summer bowl. It is a perfect size, shape and holds so much. I need to get at least four more. I’ll be getting in touch soon! Nothing will make me happier! Thank you for your sweet words, Hana. The dream: bittersweet. Traci, you’re SO right about cooking being meditative! Whenever I come home from work stressed or upset, I turn straight to my kitchen to calm and relax me. There’s something about the process of cooking that is just so…. comforting. I’m so sorry to hear about the loss of Claire. The loss of a pet is beyond difficult— my thoughts are with you as you go through this healing time!